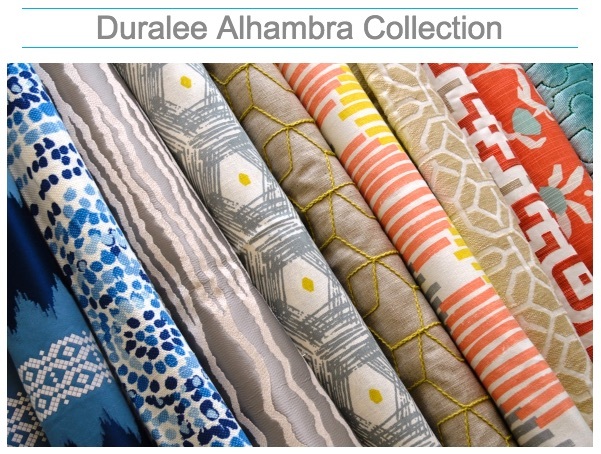 Please come in and browse our fabric books at The Fabric House fabric store in Nashville, TN, serving Louisville, KY.
We can order the Duralee Alhambra Collection fabrics for you! ALHAMBRA is the next generation in a long line of transitionally-styled collections. Global influences affect our homes and permeate our design choices at the most basic level. For the Alhambra Collection, our design studio looked to many different cultures to present their take on a modern, global aesthetic. The end result is a selection of patterns with substance and depth in a myriad of current colorways – such as citron, indigo, coral and platinum — for a fresh, modern style with international flavor.